Grandipants.com: Hey Chicago Whaddya Say? This might be the year I play hooky for a cubs game. We'll see how they are doing towards the middle of the season, but there is nothing better than a Wednesday afternoon Cubs game (so I've heard). Really, there is very little in life that is better than a baseball game on a sunny, warm day. Its like a picnic, with 40,000 strangers. And you get to yell and scream and sing. 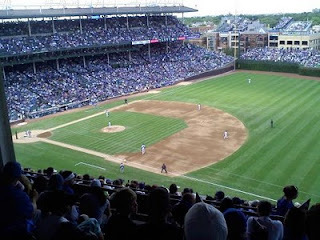 And Wrigley Field, I think has spoiled me forever. There is so much history in that park. They still have people who change the score board by hand! And there are men screaming, "cold beer! peanuts! hot dogs!" It is comfortingly stereotypical and cliche. Also, Old Style! Its so watery, but it tastes like a baseball game. And you don't have to get up. They just walk past your seat. There is alot about me that's changed since I moved here, but one of the biggest things (as most people can attest to) is how living here makes you (well, me) a sports fan. There's something to be said about living 10 blocks from a national sports landmark. And it'll change you, if you let it. Plus, its super fun. Really, I promise. Baseball games are fun. If only because its a large, open air bar with lots of boys running in circles on the field.